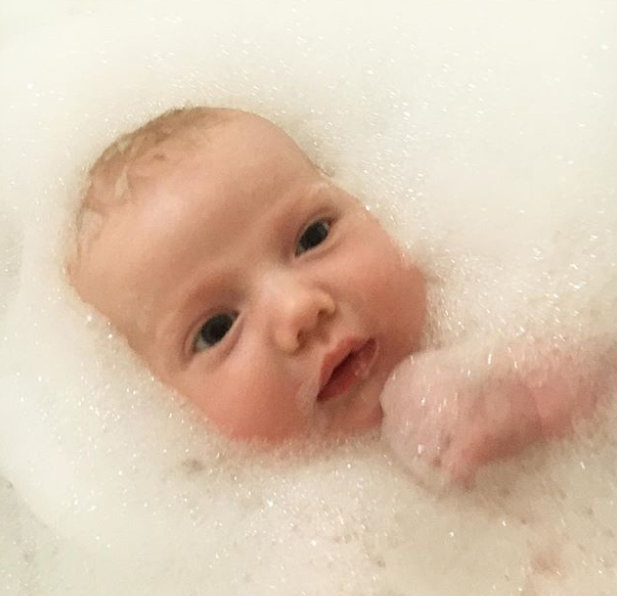 The Made In Chelsea star sparked a huge debate amongst her Instagram followers this week when she uploaded a photo of her two-month-old girl having a bath with the water surrounding her face. Binky, 27, joked that boyfriend Josh ‘JP’ Patterson was the reason for the very bubbly bath, having captioned the picture: ‘Hmmmm …… You can tell daddy ran the bath for bath time tonight!!! Most fans found the snap pretty adorable and comments ranged from ‘beautiful’ and ‘so cute’ to ‘precious’ and ‘just adorable’. However, some Instagram users weren’t so approving and warned Binky to beware getting bubbles in her baby’s ears. ‘Careful with her ears. I’ve got a 6 months old and know we should keep their ears away from water while giving them a bath. They’re so little..,’ one follower commented. This led to a bit of a debate as many Binky fans defended her. One said of the critical remarks: ‘well that’s a load of s***, you can take babies swimming as soon as they’ve had their jags in which you’re encouraged to let them swim under water so how do you explain that one?